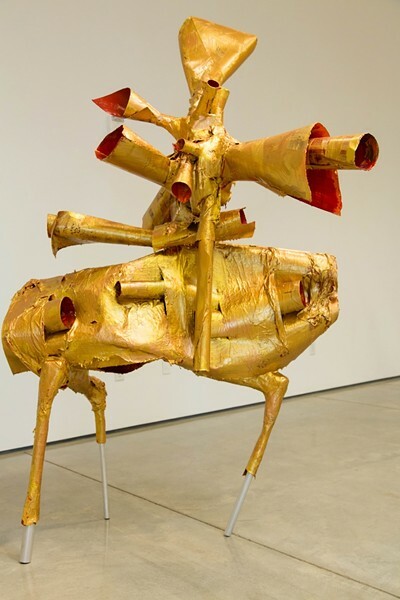 THE GOLDEN HORN : In Ecce Homo Lancelot Marini, Miles showcases his ability to make abstract sculpture look animated and almost animal-like. "As a means of contrast with the sublime, the grotesque is, in our view, the richest source that nature can offer,” Victor Hugo said in the preface to his 1827 play, Cromwell. And, although the piece was never performed, its themes of beauty, ugliness, uncertainty, and internal conflict remain some of the most potent forces at work in art, both then and now. They are, without any uncertainty, some of the central elements that underpin Southern California-based artist Christopher Miles’ haunting new sculpture exhibit at the Cuesta College Art Gallery. “I’m profoundly interested in beauty and ugliness, and finding something to reconcile that,” Miles said during the exhibit’s opening. When you wander into the gallery’s stark white room, that contrast becomes immediately evident. Towering, behemoth sculptures of golden yellow, bubblegum pink, and blood red perch on aluminum pipe next to enigmatic, globular ceramic pieces that shift in form and shade from every perspective. Though there are only 12 sculptures, they pack a powerful punch not only in terms of bold color and shape, but in their magnetic ability to defy easy definition. This is the enigmatic effect Miles intends. For the past 20 years, he has explored all realms of art—painting, sculpture, art history—as a critic, curator, and Interim Dean of the College of Arts at California State University Long Beach. With said resume, it would seem Miles’ art would be the stuff of high theory and academic discourse. And, like all art, his work does participate in those formal discussions. During the exhibit’s opening, Miles spoke about his interest in the malleability of materials, perspective, and space that drives his diverse and complex sculptures. But, in truth, this is the kind of work the must be experienced in person, in the round. To begin his pieces, Miles first makes a rough sketch of the kind of form he is after. For his papier-mâché sculptures, he erects a skeleton of aluminum piping and then layers on a mix of heavy printmaking paper and a final coat of bright acrylic paint. Even for his ceramic pieces, they all start with a deep interest in the possibility and variety of form. ARTERY : Miles’ ceramic sculptures evoke an organic and sometimes grotesquely visceral feel. Made from a mix of glass stoneware, papier-mâché, steel, and cement, his work ranges from the earthy and organ-like to the delicate and whimsical. 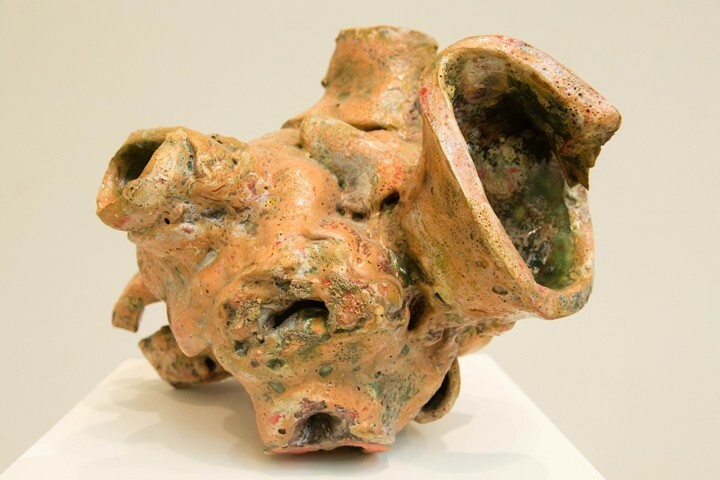 In one corner, you can see Untitled (Nugget #4), a rotund, ceramic number that resembles the festering, grey and beige-y pink remains of a whale’s heart from one vantage point, but if you bend down, to the left, and look up, could easily be the snout and right eye of a horse in the hands of Francis Bacon. Walk past the imposing, pink monolith Untitled (Jefferson Gene Lee Philip Duvall) and you’ll find yourself face to face with Untitled (Ecce Homo Lancelot Marini)— a curious combination of aluminum legs, papier-mâché horns, and aggressively slathered acrylics that would not be out of place as a creature concocted by Dr. Seuss. This is the duality that Miles covets and conveys. MILES AHEAD : Christopher Miles’ exhibit at the Cuesta College Art Gallery runs through Sept. 26. The gallery is open Mon.-Fri., from 12-4 p.m. and is located on the in room 7170 at the Cuesta College campus right off of Highway 1 in San Luis Obispo. For more information, you can visit cuesta.edu or call 546-3100. 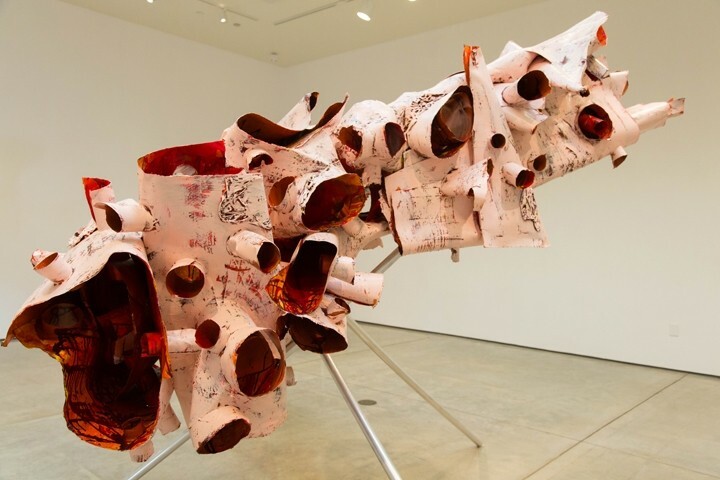 In some ways, his work appears childlike and artificial; in others, it conjures ghastly and visceral images of dismembered bodies. There is no certainty, only conflict and provocation. Miles’ work exists in the slippery space between abstract thought and grounded, brutal materiality. But, it’s that slippery space that motivates Miles in the first place and makes his work, as Hugo said, sublime in its grotesqueness. Jessica Peña would happily eat a whale’s heart. Send one to her at jpena@newtimesslo.com.